ARKit will instantaneously become the largest augmented reality platform in the world -- but to capitalize on that, developers will need to come up with awesome uses of the technology. With only a few weeks under their belt using Apple's iOS 11, content creators have already begun to impress in big ways. Unsurprisingly, Apple's developer community has been quick to embrace ARKit, providing impressive early examples of what the new tools are capable of. AppleInsider shares with you some of the best examples we've seen so far, even in its early state. The earliest examples of ARKit-enabled apps were one-time mainstays of the App Store -- measuring apps. 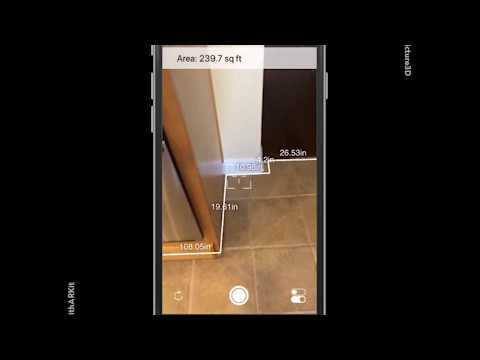 Implemented relatively early on, developers cranked out solutions for measuring a room with the iPhone's camera -- with limited success and generally poor accuracy. Developer SmartPicture cranked out an app that measures a kitchen or other room. While the technical demonstration is impressive, we suggest you mute the audio. A follow-up Tweet by the company says that measurement accuracy will get better with time, with existing technology not using ARKit said to be 99% accurate now. While an official effort from Ikea has been announced to drop its furniture virtually into your house, that isn't stopping other developers from making their own solutions. Developer of Threes Asher Vollmer is in the process of creating a tool to lay out rooms, and place furniture in a space in real-time, much like Ikea is planning. The technology isn't just for augmented reality. NormalVR is developing a painting and art app with the artist wearing a HTC Vive connected to an external GPU on a Mac. The video of the virtual painter, as well as what was being painted was captured on an iPad Pro parsing the data -- cross-platform AR and VR, between Mac and iOS. 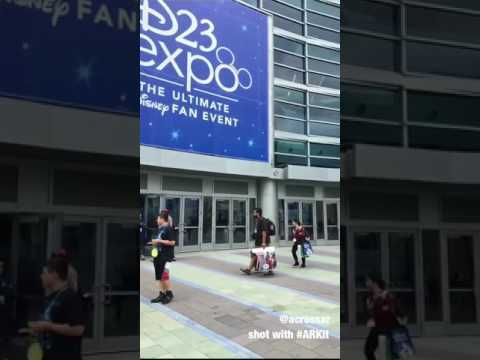 While at Disney's D23 expo, Steve Lukas dropped Mickey Mouse in front of the expo center. While presently a static demonstration, the concept illustrates how a large media conglomerate like Disney can make a shared space with the technology, featuring existing intellectual property in a common space at some point in the future. Using Unity, CASA research assistant Valerio Signorelli is part of the Virtual London Platform, and has built a version in ARKit. The project is streaming data in real time from an external database, and can pull out layers for examination, like the London Underground, roads, and buildings. Additionally, it can show the impact of a major development on the panorama, and could be used as a simulation layer for other effects later in the program. 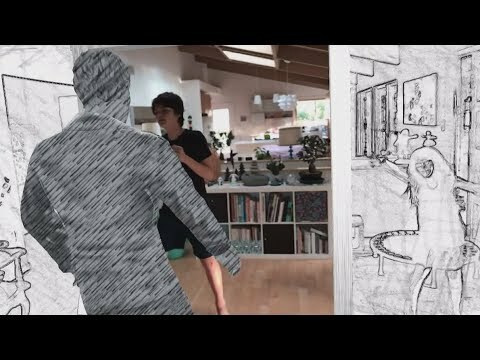 An aspect of ARKit that will probably see the most use is in gaming. The base concept was demonstrated on stage at WWDC, with a game running in ARKit on the Unreal Engine. A new example was just published by Directive Games, with a port of "The Machines" running on an iPad with ARKit. In the '80's, a lot of time and money was spent on Norwegian band A-Ha's _Take on Me_ video. Rotoscoped mostly by hand, it won several awards, and was heralded as what the short-form music video format was capable of. Chicago's Trixi Studios developed the interactive app, rendered in real-time, using assets from the Unity 3D's Asset Stores. There's a lot going on with Apple, more than ever, and we can't show you every ARKit example that hits the web. A number of Twitter accounts have popped up to fill that void, chronicling developer's shared videos of ARKit apps. In our opinion, one of the best accounts is MadewithARKit. Updated frequently, the feed curates the best of what it sees, and appears to be the most frequently updated stream at this time. Yeah, I guess people could do that to you. AR tabletop gaming on the other hand… You probably still need to "buy" your army, but you miss out on the joys of painting them! Had an android idiot tell me "my android had AR already, it's called Pokémon Go." I'm still failing to see how most of this is useful at all. Measuring a room could be handy, or maybe a yard. I can see how placing furniture in your room could be helpful in making a purchasing decision. But most of the other stuff just seems like a cool demo, a "Hey, look what we can do." Don't get me wrong, the tech is impressive. But placing a virtual Mickey Mouse outside of D23, or anywhere really, seems like something someone may do once or twice just to try it and then forget about it. I still don't understand how an AR version of the game presented above improves the game play. If anything it seems like it would make it unnecessarily harder. What is the advantage to playing the game "on your table" versus just playing it on your phone normally? Seriously, am I missing something? Again, all of it is cool, but what advantage is there for the regular consumer? That's my continuing question in all of this. It's limited and requires a lot of processing to work with Pokemon Go, but it is AR. That's always a question for any product. What advantage is there in the Apple Watch for the regular consumer? If there's a compatible use-case, then there's a market. There's some form of market, since Pokemon Go is AR. It'll go big with historians, and educators. Regarding games, ARKit can be integrated with Machine Vision. Think fields of fire and range measurement from miniature X to Y. I play Destiny, other people I know don't play shooters like that, and may be more interested in a clicker in at the bus stop, or something like that. Let the developers figure it out before you crap on it. You're right - some developers will bail after making a digital whatever. Many won't. So far no one has shown anything other than an auxiliary usage for the technology. I've even heard someone say it will replace displays, which is like saying CDs will replace music. This stuff could do wonders for the board game/role-playing game industry. Imagine a version of Monopoly where you can see animated characters and effects dramatizing the play on the board, or a game of Risk where you could zoom in on the battles? Or even a game of Chutes and Ladders where you could build your own crazy board. We're going to see some really cool stuff coming out of this soon. Developers are excited because they can now place a Mickey Mouse outside of D23 with very little effort. They don't have to write and debug special AR code that might require an additional programmer or longer development time as it did before. That doesn't equate to value for the end user but it opens up so many possibilities that were out of reach before. ARKit is like opening an entirely new app store for nearly every iPhone in the wild. So instead of compelling apps trickling in over the first few months like we had 9 years ago, we will see many polished AR apps that blow these demos away. So I can't speak to the usefulness of AR apps yet because they haven't been released but just having many more choices immediately means the useful ones will rise to the surface and spawn further creation or knockoffs. I have no idea. What post? There's no moderator action on this thread at all. Failing to see use? Did you miss the Aha demo? 1) You just answered your own question. 2) As for AR table-top gaming (and even furniture previewing) this will become interesting when there are good AR glasses. Then we get to play in 3D-space, akin to holograms. As with most new tech, the use cases need not be fully known from the onset. Augmenting reality requires the system to have a model/map of reality that they can overlay. Youre right that augmenting a table to show a game on it doesn't really achieve much. But the neat tricks will expand into things we can't do any other way. The furniture stores are are an example. Someone will make a "will this fit?" App that takes an image of your current cupboard and a space on your wall and tells you if it can be moved. The phone will be making full 3D models of what it sees, and what can be done with that will be staggering. There'll come a time when you raise your phone in the supermarket, and it overlays health information on the image. Crosses out your allergen foods and highlights your favourites (green highlight on all the non-dairy Indian curries?). Or circles the items from your shopping list so you can pick them up. This won't happen for a few years but it's where it's heading. Also video chat will take a person you're talking to and show them standing in the room with you. Again like they're invisible but right there, you just need the phone to see them. I imagine my kids will will have an imaginary friend app, probably linked with a toy. My kids would like to think there's an invisible Mickey Mouse they can only see through the Disney Magic Mirror, who lives in their room and is always there with them. And perhaps they'll buy a Lego "Invisible jet" that will land next to their hand built plane, but they can watch it fly around and follow it. Or they'll have a game with a path for them to follow and hidden treasures. This is a big step to a new way of interacting... but there are many steps. I agree. Developers really need to find a way to monetize this stuff. However, I think it should be able to be used for educational and training purposes in schools and businesses. I'd sure pay for apps where a person could take tours inside the human body or tours of the cosmos. I like how it's used with GPS to guide a person around. I'm not very imaginative but I'm sure there must be people who will be able to take advantage of this technology. I really like how AR enhances maps. One thing I'm really interested in is instant translation of text on signs and menus or explaining usage about the medicine in a bottle. It just seems like it could be quite useful. I just have a feeling that ARKit will increase sales of Apple products to some degree. I asked if a sentence could be reworded because it was a bit confusing. It posted, then when I came back later, it was gone. It was the second post in the thread. A follow-up Tweet by the company says that measurement accuracy will get better with time, with existing technology that it is using not using ARKit with pictures and a calibration marker is 99% accurate. Huh. Nothing in the logs. Sentence cleaned. Yeah, very strange. Anyway, what do you think about the sentence? The Aha video is just mind blowingly fun to do in real time. I think many lack imagination, Apple's really starting something big on the AR front and I suspect they've got also a lot of hardware in the pipeline to support it. Many on the Android front won't know what hit them and their pathetic touting of Samsung's "innovations" (sic), cause yeah a bigger screen (and nothing else is soo innovative) is going to look mighty silly.